A portion of the proceeds will be donated to The Arts Center. Join us for a slide presentation and question-and-answer session on Thursday, April 25, 2019 from 6 pm - 7 pm. Light refreshments will be served. Please RSVP by clicking here to register for the presentation. If you have further questions about the trip or the presentation, email Jean Spearman of As You Like It Tours or call at 864-643-5589. Would you like to be an instructor for our 20 Artists x 20 Workshops event happening August 10th and 11th? Click here to submit a proposal by May 6th. Register for Summer Art Camp. Spaces are filling fast. Register for Winter/Spring and Summer classes in all our studios. Pre- registration is required three days before the start of class or workshop. Save the Date! Family Fun Day. Inclement Weather Policy: When the Pickens Schools are closed The Arts Center will be closed. For additional information about this policy click here. We are The Arts Center of Clemson. We provide exceptional art education to adults and children and make art exciting and accessible to the community. The Arts Center has four studio classrooms which are equipped for jewelry, ceramics, drawing, painting, photography and a variety of other enrichment activities. We offer an exciting selection of programs taught by qualified, artist instructors in a variety of disciplines. Pre-registration is required three days before the start of class or workshops. Want to teach at the Arts Center? We are currently looking for artists who want to share their knowledge with adults and/or children through classes or workshops. 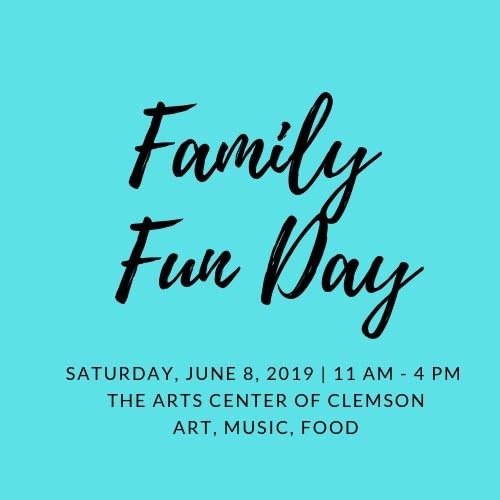 Contact Program Director, Jackie Roux at 864.633.5051 or email jackieroux@explorearts.org for more information. As a non-profit, a lot of the work we do at The Arts Center is dependent on help from our volunteers. We need help in many areas, at a variety of times during the day. Volunteer opportunities range from administrative tasks, special event preparation, class assistants and even long-term internships. Please be advised that we may not have available opportunities in all areas at all times. Fill out the form here and someone from The Arts Center staff will contact you.